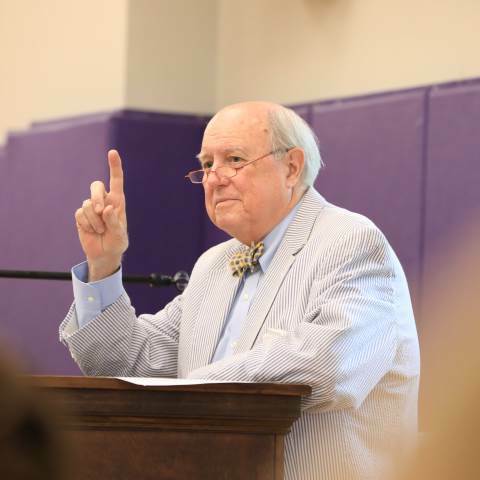 Sam Moss ('63), dean of college guidance, talks with seniors about the college admission process at Darlington's annual College Boot Camp, held on the first day of school. SAT scores for students at Darlington were above the local, state and national averages on an updated report recently released by The College Board. Darlington posted a total mean score of 1191, 137 points higher than the state average of 1054 and 142 points higher than the national average of 1049. Darlington students received an evidence-based reading and writing score of 593 and a math mean score of 598. The average statewide was 537 for the reading and writing portion and 517 for math. The average nationally was 529 for reading and 520 for math. The SAT is one of the two standardized tests used for college admission. The test, administered by The College Board, is seen as one assessment of a student’s readiness for college. The ACT, administered by American College Testing, is the other. The SAT total score ranges from 400 to 1600, and the ACT composite score is based on a scale of 1 to 36. Colleges use whichever of the two scores a student submits for admissions purposes and have no preference for one over the other. "Many colleges base admissions decision solely on a student’s high school GPA and SAT or ACT scores," said Moss. "Other colleges make the admissions decision by 'reading holistically.' This means that in addition to the GPA and test scores, a number of other factors may be considered. Factors such as leadership, athletics, activities, geographical and socioeconomic factors, teacher recommendations, and legacy status are among those that may be taken into consideration. Both the University of Georgia and Georgia Tech, for example, make decisions by the holistic method." Darlington's uniquely structured College Guidance Program is led by 13 seasoned college advisers, which translates to approximately one adviser per every 10 seniors. Students meet with their college adviser a minimum of twice per week, providing the support our students need to help them find the right fit and make the best decisions about their futures.